Though we are a newly formed group, thanks to our members, we are fortunate to collectively benefit from over 50 years of working and living with guide dogs. We are a chapter of the American Council of the Blind of New York (http://www.acbny.org/). Geographically diverse, our members meet via teleconference bimonthly as well as in person during the annual New York ACB State convention and conference. The path we walk together is unique and rewarding– with your help, we can become an effective tool and source of support for all guide dog users residing in New York. FAQ Do you have questions about how a guide dog performs a task. We’ve got the answers. Testimonials — to read how partnering with a guide dog can enhance the independence for someone who is blind. We are grateful to April Chiappetta who made our new logo! You can follow April on Instagram at her handle fortheloveof_flowers. Westchester County Executive Robert P. Astorino met with guide dog users and advocates in recognition of International Guide Dog Day. Guiding Eyes for the Blind and Westchester Council of the Blind received proclamations from Mr. Astorino in honor of International Guide Dog Day. The president of Guide Dog Users of the Empire State and the Director of the Office for People with Disabilities for Westchester County were also present, joined by a County employee who is a guide dog user and two other guide dog teams, also Westchester residents. 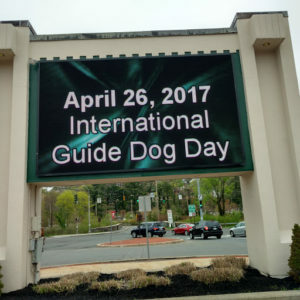 International Guide Dog day was instituted in 1989 to commemorate the formation of the International Guide Dog Federation and is recognized worldwide on the last Wednesday of April.